The UK’s deputy Primeminister Nick Clegg has been held to account by pensioner Gillian Duffy, the staunch Labour supporter who hit the headlines in May last year. Mrs Duffy is was inadvertently on the receiving end of callous comments made by former Prime Minister Gordon Brown, after she challenged him on immigration. The story was covered by WVoN here. Nick Clegg was visiting a factory in Rochdale when Mrs Duffy stopped him to ask whether he was happy with the coalition govenrment’s policies. 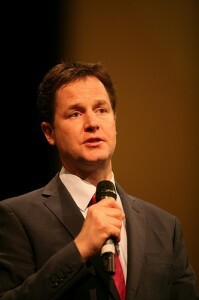 Mr Clegg told her the government was taking tough decisions in order to cut the UK’s deficit. Mrs Duffy, who was reportedly encouraged to approach Mr Clegg by the local Labour Party, accosted the deputy PM as he entered the factory. She asked him why the Liberal Democrats had chosen to go into coalition with the Conservatives rather than Labour. “Gordon Brown and I talked about it… [but] there was no way that the Labour Party and the Liberal Democrats would have had enough MPs to run a government,” he said. Mrs Duffy asked Mr Clegg whether he could look her in the eye and say he was happy with the coalition’s policy decisions. Mr Clegg attempted to explain the reasoning behind the government’s controversial deficit-reduction strategy, saying future generations would suffer if savings were not made now. Afterwards, Mrs Duffy said Mr Clegg had failed to convince her that the coalition was making the right decisions. Why is Gillian Duffy still supporting the labour party after the whole “bigot-gate” incident? It’s sad to see they are trying to use her as a tool to score petty political points. She should realise they are making a mockery of her. What is Nick Clegg supposed to say? Everyone knows the maths for a Lab/Lib coalition couldn’t have worked and the current situation was the only option to stabilise the economy. Red Ed should leave old ladies in peace!